In our previous post, We have posted some best Tips and Tricks to Extend your Laptop battery Life. We have got some huge response from our readers, some of them ask how to automatically reduce the power consumption by using software. In this Article We are going discuss about the Battery Booster. 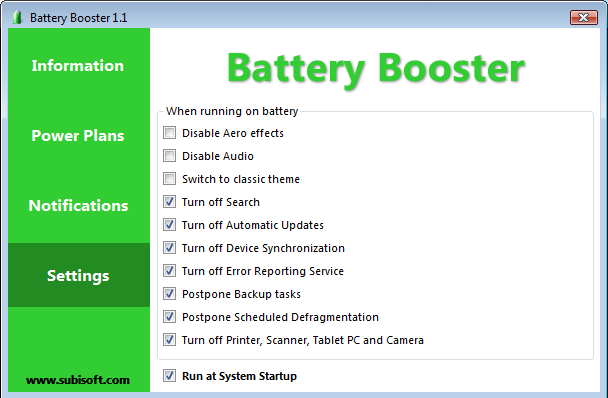 Battery Booster is a very small windows utility which is a powerful battery boosting tool and power management application. features that are running in the background and not strictly necessary. They are stopped or turned off, which can reduce energy consumption considerably to extend the battery life of your laptop. It will turn off unnecessary background services to saves battery life. I have personally tested it in Windows 8, i couldn’t able run this program. Although I have used Windows compatibility option to runt this program. Recommended Read : Tips and Tricks to Extend your Laptop battery Life [How To].